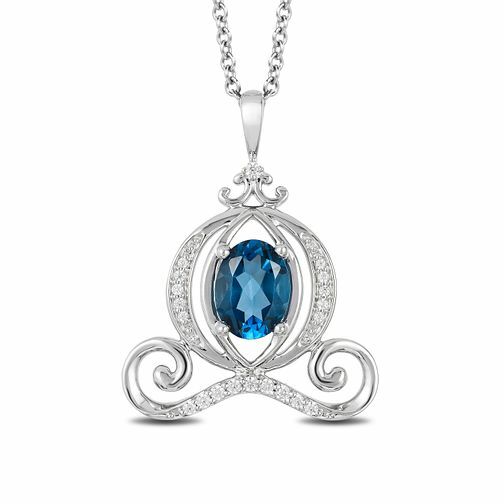 This wondrous gemstone and diamond carriage pendant from the Enchanted Disney Fine Jewelry collection inspired by Cinderella is a look every girl will want to wear. Crafted in sterling silver, the shimmering diamond-touched design features an 8.0 x 6.0mm oval-shaped London blue topaz. Radiant with 1/10 carat of diamonds and a brilliant buffed luster, this magical pendant suspends along a 17.0-inch cable chain with 2.0-inch extender that secures with a spring-ring clasp.